Take the guesswork out of your workouts and turn your fitness goals into a science. CycleOps' 300 model combines this brand's standard Pro Series frame, Joule™ 3.0 cycling computer, and Power Tap technology for extremely accurate +/-1.5% power feedback. Joule™ plus Power Tap means you can track, measure and record your workout specs and results to the finest degree. And CycleOps' precise resistance control lets you adjust the difficulty level of your ride, while the freewheeling hub lets you take breaks and coast when needed. The stable platform allows for sudden sprinting workouts or inspired hill climbs. Built on CycleOps' standard Pro Series frame, it features CycleOp's standard freewheel gearing. Totally adjustable to fit your frame and riding style. 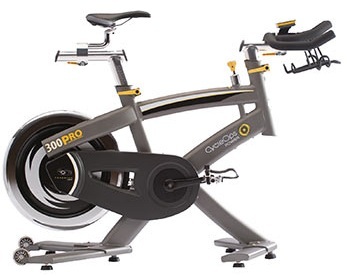 Buy CycleOps Pro 300 Indoor Cycle - FREE SHIPPING! Data transfers easily to your Mac or PC through a simple USB connection; in fact, you may get so much out of your Pro 300 workouts that you'll make excuses to ride inside!